In a time when many are ready to awaken to a New Earth Consciousness, Lia Scallon provides us with an exceptional new tool: Crystal Keys – Songs to Awaken and Heal – the ninth album by this internationally renowned vocalist and sound healer. 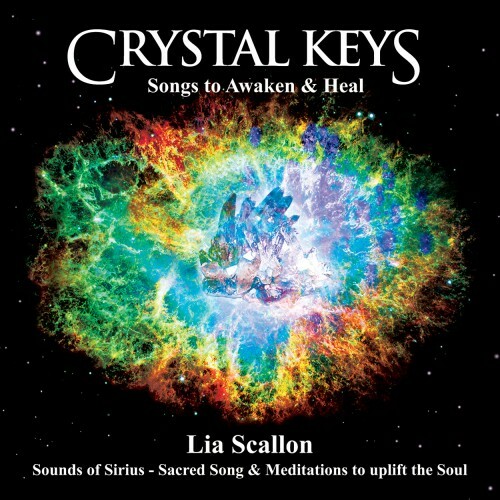 Lia’s voice and music carry coded Messages of Light – Crystal Keys – to unlock the doorways to your heart and soul, helping you to awaken and heal at the deepest levels. In ancient times these Light codes were available in the sacred sound chambers of Ancient Egypt and the legendary Crystal Healing Temples of Atlantis and Lemuria, where priests and priestesses used sacred sound to unlock the healing energies, information and Light held within the crystalline realms. Now, in this magnificent and powerful recording, these Crystal Keys are available to us, once more. Each track on Crystal Keys carries within the music, vibrational messages from the Master Deva of that particular crystal. Lia wished to provide the listener with pertinent information about each of the crystals, to help them connect with and tune into the powerful crystal key frequencies, as they listen to the music. She found exactly what she was looking for in the channelled messages of the crystals masters, brought through by Justin Moikeha of ‘The Liquid Crystals’ http://theliquidcrystals.com With Justin’s permission, Lia shares these messages with you, within a beautifully illustrated lift-out booklet, placed inside the album digipak casing. The messages from each of the Master Crystal Devas, will give you a powerful insight into their character and qualities, and will prepare you in a most beautiful way, to receive their Crystal Keys with an open heart. Musically, Crystal Keys is Lia’s most ambitious project to date. She assembled a group of world-class musicians to record with her. Their musical accompaniment provides an exquisite backdrop to Lia’s channeled vocals. Winner of the prestigious 2010 Melbourne Prize for Music, David is one of the most innovative and musical drummers in the world. Apart from his solo concerts, David has supported a vast array of Australian and International artists, including John Farnham, Don Burrows, James Morrison, and Tommy Emmanuel. Involved in the recording of over seventy albums worldwide, Mark Mannock has recorded with, written for, performed and supported artists such as Tina Turner, Joni Mitchell and Annie Lennox. TV compositions include the American Survivor series. Mark has won several awards including an award for ‘Outstanding Services to Education’. One of the world’s leading exponents of the didgeridoo, David Hudson is also Artistic Director of the internationally renowned Tjapukai Dance Theatre. David has toured the world performing both on his own, and with the legendary Yanni, playing in venues ranging from the Taj Mahal to the Egyptian Pyramids. A former member of 1970’s chart-topping, British folk-rock group Steeleye Span, Nigel is a highly sought after music producer and engineer, with some 200 CD’s, film and TV and advertising soundtracks to his credit. A two-time Aria award winner and five-time Aria nominee, Nigel has won awards for Best Producer, Best Engineer, and Best Album. As with all of Lia’s other eight albums, the artwork for Crystal Keys was of paramount importance. Lia always strives to ensure that every aspect of the energy she is bringing through in her music, is realized with as much perfection as possible. All the Sounds of Sirius albums therefore, feature specially commissioned original artworks, which reflect the loving energy and message of the music. Somehow, regular jewel case packaging didn’t seem sufficient for this very special album! The Crystal Keys disc sits like a jewel itself, inside a very beautifully designed six-panel digipak casing. Also included is magnificent separate six- page booklet insert, containing channelled messages from the Crystal Guardians of each of the individual gems featured on the 10 album tracks.